Staying in a cozy log cabin during your stay in Montana's Glacier Country brings a whole different feel and experience to your Glacier National Park Vacation. Glacier National Park Cabins are cozy and private, giving you a lot more peace and privacy than a standard hotel or lodge room can provide. Plus the unique look and feel of a private log cabin will make you immediately feel at home no matter where you choose to stay in or around the park. North Forty Resort The North Forty Resort has 22 premium log cabins available as vacation rentals on 40 private acres just outside of the resort town of Whitefish, MT. There are fourteen single family cabins available and eight duplex-style cabins. All cabins offer amenities such as gas fireplaces, full kitchens, comfortable down bedding, barbecue equipment, free wireless internet, cable TV and more. Silverwolf Chalets Silverwolf Log Chalet Resort is located just minutes from the main western gate to Glacier National Park. This resort provides 10 private log chalet accommodations in a quiet, intimate setting amongst the evergreen trees and only a short walk from Lake Five. There are nine standard chalet cabins which offer amenities like gas log fireplaces, full bathrooms, satellite TV, wireless Internet, mini fridge, daily maid service and more. There is also a deluxe log chalet that offers two bedrooms one bath and more than 1,300 square feet of living space. 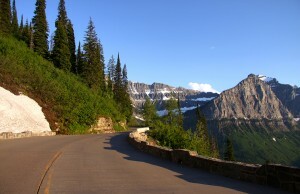 Silverwolf offers a variety of Glacier National Park cabins to choose from. Stanton Creek Stanton Creek Lodge is located along the southern border of Glacier National Park along Highway 2 in the middle of thousands of acres of some of Montana's most beautiful backcountry. All these Glacier National Park cabins at Stanton Creek are non-smoking and include a microwave oven and refrigerator and some cabins include satellite TV. Stanton Creek also includes a main lodge area with a small restaurant/bar and common area where you can kick back beside the fire and watch television or play games. Stanton Creek provides some of the best value in the area. Historic Tamarack Lodge & Cabins This historic lodge and cabins resort was built in 1907 and encompass the history and authenticity of the West Glacier area. The entire resort was renovated in 2003 and today is a very nice place to call 'home' during your Glacier National Park vacation. The lodge itself provides a great atmosphere to congregate with other guests and enjoy the warmth of a crackling fire, or the fun of games and activities with a foosball table, pool table, cable television and more available for guests enjoyment. Tamarack Lodge & Cabins also provides a good variety of Glacier National Park cabins to choose from, ranging from single bedroom cabins with one queen bed to multi-storied and multi-room cabins that will sleep up to four.